^ Gatewood, Willard B. (1990). Aristocrats of Color: The Black Elite, 1880-1920. Bloomington, Indiana: Indiana University Press. p. 306. ISBN 1-55728-593-4. Retrieved August 29, 2012. ^ Smith, Jessie Carney (2006). Encyclopedia of African American Business, Volume 1. Westport, Connecticut: Greenwood Publishing Group. p. 474. ISBN 0-313-33110-3. Retrieved August 29, 2012. 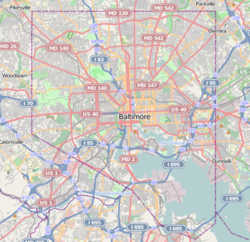 ^ "Archdiocese of Baltimore National Parishes" (PDF). St. Mary's Seminary and University. Archived from the original (PDF) on 2013-12-02. Retrieved 2012-08-23.